The job isn’t done when the presses stop. 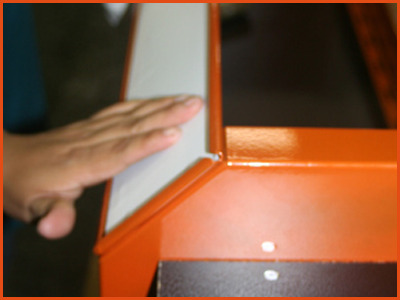 Post press fabrication is a vital stage in any metal fabrication project because it involves the techniques that impact product appearance and durability. Accurate Metal Fabricating provides a full range of finishing techniques to yield flawless and smooth end results—techniques such as grinding, polishing, deburring, and sanding. A wide range of finish colors are also available in finish techniques geared toward specific metals, intended use, and interior or exterior product location. We offer powder coating, anodizing and fluoropolymer finishes. A hard finish that’s tougher than paint, even available in thermoplastics. 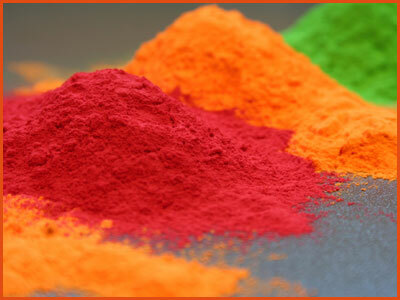 Powder coating is a type of finish for metal that is applied as a free-flowing, dry powder. The main difference between a conventional liquid paint and a powder coating is that the powder coating does not require a solvent to keep the binder and filler parts in a liquid suspension form. The coating is typically applied electrostatically and is then cured under heat to allow it to flow and form a "skin." The powder may be a thermoplastic or a thermoset polymer. Powder coating is used in some fabricated metal applications to create a hard finish that is tougher than conventional paint. When your aluminum product requires a durable, corrosion-resistant finish ready for the addition of color or a sealant, anodizing is one option that Accurate Metal Fabricating can employ. Anodizing increases the thickness of the natural oxide layer on the surface of metal parts, changing the microscopic crystal structure of the metal’s surface. Anodized aluminum surfaces are harder than aluminum but have low to moderate wear resistance that can be improved with increasing thickness or by applying suitable sealing substances. In addition to hardness and corrosion resistance, anodizing is a good surface preparation for dyeing (coloring), improved lubrication, or improved adhesion. The anodic layer is also non-conductive. PVDF Resin / Kynar—the highest in purity, strength, and resistance in the fluoropolymer family. Polyvinylidene Fluoride, or PVDF, is a highly non-reactive specialty plastic material (“thermoplastic”) in the fluoropolymer family generally used in applications requiring the highest purity, strength, and resistance to solvents, acids, bases and heat and low smoke generation during a fire event. Compared to other fluoropolymers, it has an easier melt process because of its relatively low melting point of around 177°C. 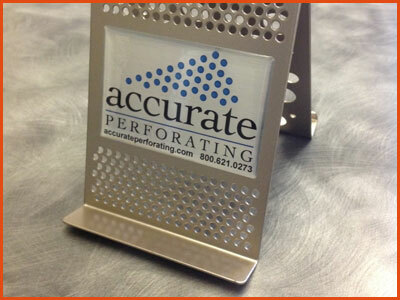 Accurate Metal Fabricating uses Kynar® brand PVDF materials to apply this finish to your fabricated metal products. 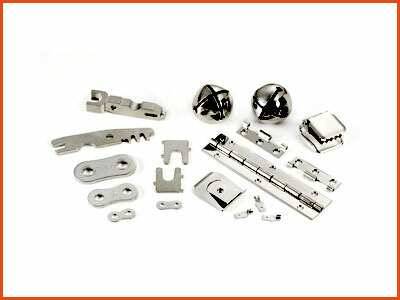 Plating—for decorative features as well as durability, reduces corrosion, improves solderability. Plating is a surface covering in which a metal is deposited on a conductive surface. Plating has been done for hundreds of years, but it is also critical for modern technology. Plating is used to decorate objects, for corrosion inhibition, to improve solderability, to harden, to improve wearability, to reduce friction, to improve paint adhesion, to alter conductivity, for radiation shielding, and for other purposes. 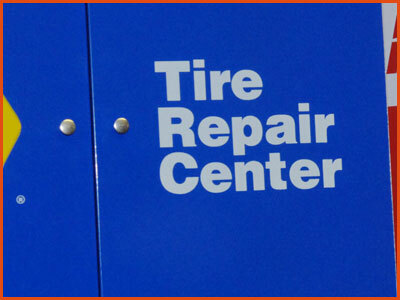 Graphics / Logos / Decals—to customize your order. 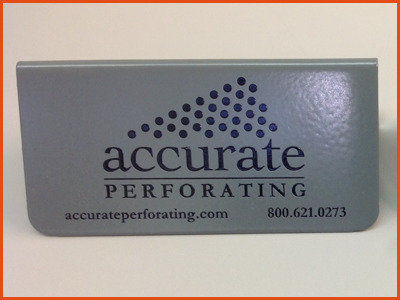 Accurate can apply graphics, logos, and decals to nearly any product surface including metal, glass, wood, and painted material. We can work with our vendors to create custom tailor-made graphics to meet your specifications. Choose the size, shape, material or color that works for you. Use these applications to decorate, identify products, places, equipment or systems; communicate ideas, instructions or warnings; or promote companies, programs, services or events. Accurate’s experienced team also produces customized graphics or collaborates with your design team on logos, decals, screenprinting, and silk screening for your brand. The finishing on your materials can be custom color matched to your color palette. Screen Printing / Silk Screening—unique customization available. Screen printing or silk screening is a stencil method of print making in which a design is imposed on a screen of silk or other fine mesh, with blank areas coated with an impermeable substance, and ink is forced through the mesh onto the printing surface. Screen printing is more versatile than traditional printing techniques. The surface does not have to be printed under pressure, unlike etching or lithography, and it does not have to be planar. Screen printing inks can be used to work with a variety of materials, such as textiles, ceramics, wood, paper, glass, metal, and plastic. Accurate Metal Fabricating has the capability and machinery to employ screen printing or silk screening on your finished fabricated metal product. Polishing / Grinding / Timesavings / Deburring—in a variety of smooth or brushed finishes. Accurate Metal Fabricating saves you time and delivers a beautiful finished product with expert polishing, grinding, and deburring services. Grinding is considered one of the most accurate of the existing machining processes. 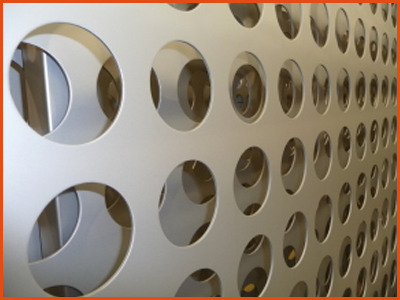 In precision sheet metal fabrication, grinding is performed to yield a very fine finish of accurate dimensions. 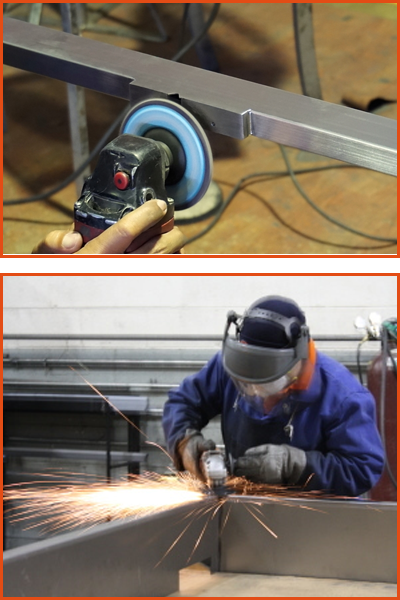 In essence, grinding is a cutting process utilizing abrasives as the cutting tool. Typical grinding tools include handheld power tools, such as angle grinders and die grinders, as well as fixed belt and bench grinders. Closely related to grinding is sanding, a process performed to either smooth the surface or to prepare the surface for a finishing process. Both sanding and grinding demand a high level of skill to produce accurate dimensions and finish, and, like deburring, are given careful consideration to deliver the best value and lowest costs to our customers. Burrs are generally unwanted material remaining after a machining operation such as punching, grinding, drilling, milling, or turning and are usually in the form of a raised portion on the surface of the component. When these burrs are removed it is called deburring. Burr formation in machining processes can account for a significant portion of the total machining costs depending on the design and the need to remove burrs or sharp edges from the component. The cost impact of deburring should not be underestimated if it is essential to the design. Effective deburring begins with the correct selection of die clearances used in the perforation process to minimize the formation of burrs. To provide the best value, Accurate utilizes a Timesavings machine wherever possible and also incorporates other equipment available to insure accurate, professional, and cost-effective deburring. After the grinding, sanding, and/or deburring process, we can polish you metal components with a variety of finishes, including smooth and brushed finishes. We have earned a solid metal finishing reputation from years of flawless quality metal polishing and buffing workmanship and competitive pricing. Our goal is to exceed your expectations. We will solve your challenges utilizing all of the knowledge, experience, and dedication our well-trained team has to offer. 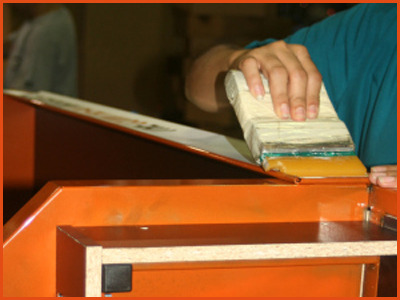 Our finishing capabilities are unrivaled. We can manage any specialized finishing request you may have. With over 75 years of experience in metal fabrication and finishing, we have a wide breadth of knowledge to draw from and to offer suggestions and solutions for your project. 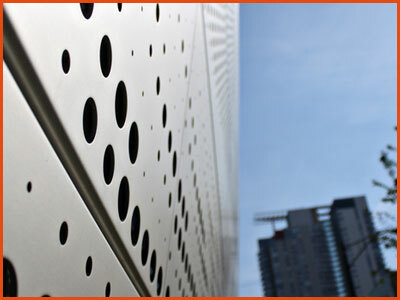 With Accurate Metal Fabricating, your possibilities for finishing are virtually endless.